President Trump explains each of the historic decisions that have already made America great again, and how he always triumphs over the fake news media. You'll learn what he really thinks of his cabinet members and top aides not related to him, of the First Lady and the First Daughter and the additional three or four Trump children. Included at no extra charge is a lavish and exclusive portfolio of spectacular, historic and intimate color photographs of President Trump in private – inside the White House, inside Mar-a-Lago, at Trump Tower, and more. 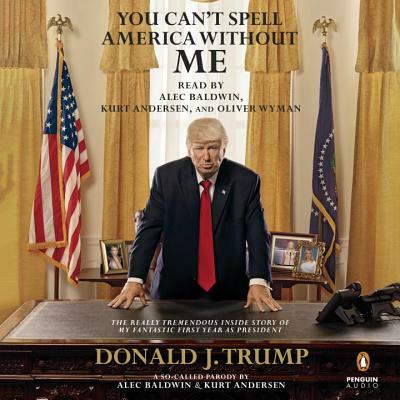 You Can’t Spell America Without Me is presented by America’s foremost Trump scholar Kurt Andersen as well as America's foremost mediocre Trump impersonator, Alec Baldwin. Alec Baldwin is a multiple Emmy, Golden Globe, and Screen Actors Guild Award-winning actor, producer, comedian, and philanthropist. He has also been nominated for an Oscar and a Tony Award and the author of the New York Times bestseller A Promise to Ourselves. Kurt Andersen is an author/novelist and host of the public radio show Studio 360. He is also co-founder of Spy and author of Fantasyland: How America Went Haywire: A 500-Year History, which Random House is publishing in July 2017.